I am so thrilled to be sharing some Banksia creations with you today! I’m so grateful for all of the wonderful testers who help us test our patterns, without all of you we couldn’t keep creating such high quality patterns. A big huge thank you to every single person who helps us test, i wish i could hug you all! Some of our Banksia testers have very kindly allowed us to share their makes with you, and they are absolutely gorgeous! I’m getting so many ideas for what I can make next! 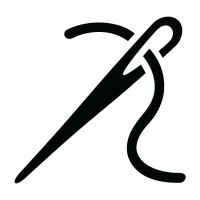 I hope you love browsing these beautiful makes as much as I did – and don’t forget to check out these ladies blogs and Instagrams for more of their sewing journeys. I love the big Peter Pan collar. It’s so pretty! Also how cleanly the neckline is finished with a self fabric facing (so clever!). 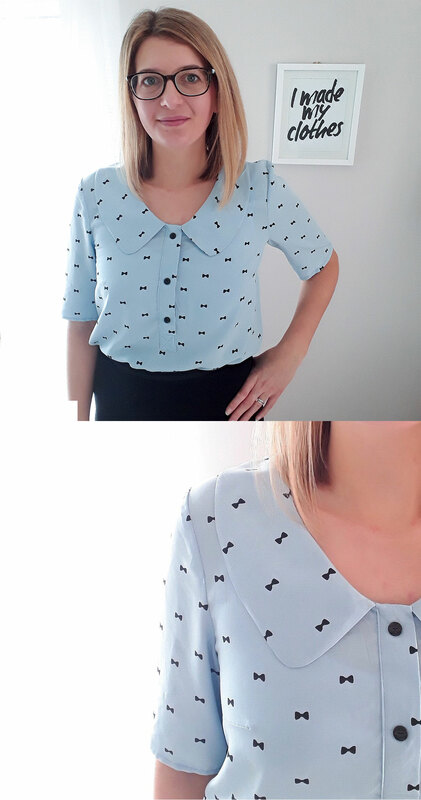 It’s a fantastic pattern and my perfect blouse! A lovely breezy summery blouse, but also can be made up for all seasons with the right fabric. I’m planning a few more blouse versions as it’s the perfect work top for me. Also I have think it would be fantastic lengthened to a dress with an elasticated gathered waist. I can’t wait to make many more versions! The scoop neckline and the woven fabric use. I want to do a sleeveless version, and a sheer version. I’d even like to do a 3/4 sleeve with a little bias tie on the sleeve. I love the simple shape of the garment, and the dart creates a more flattering fit. V3 is a fun garment for something a bit more special, but V1 is one of those staples, I know I will use again and again. I would love to make a simple white double gauze of V2 for the summertime. It’s versatile and useful to add to my work wardrobe. Also, it’s sweet, but not too twee. I made two versions – Version 1 in a random stash-poly from when putting birds on everything, and Version 3 in a black and white japanese cotton poplin that’s buttery soft. I’d love to make Version 3 again in a contrasting colour collar- and I might make a few more Version 1s as they could be a great work basic. I’m totally in love with the scoop neckline, it feels very feminine. My next Banksia is going to be a sleeveless version and I will attempt the button placket, which will be a first ever! The collar gives it such a cute retro vibe! I was surprised by how much I like the large Peter Pan style collar. That is my favourite part! I have some navy viscose with beige and pink flowers which I’d like to make into a dress version of v3 with shorter sleeves for spring. I’d also like to try v1 in some red viscose. The different options: you can make a very simple woven tee, but also add more details with the placket and the collar. I might have to try the collared version at some point in the future! 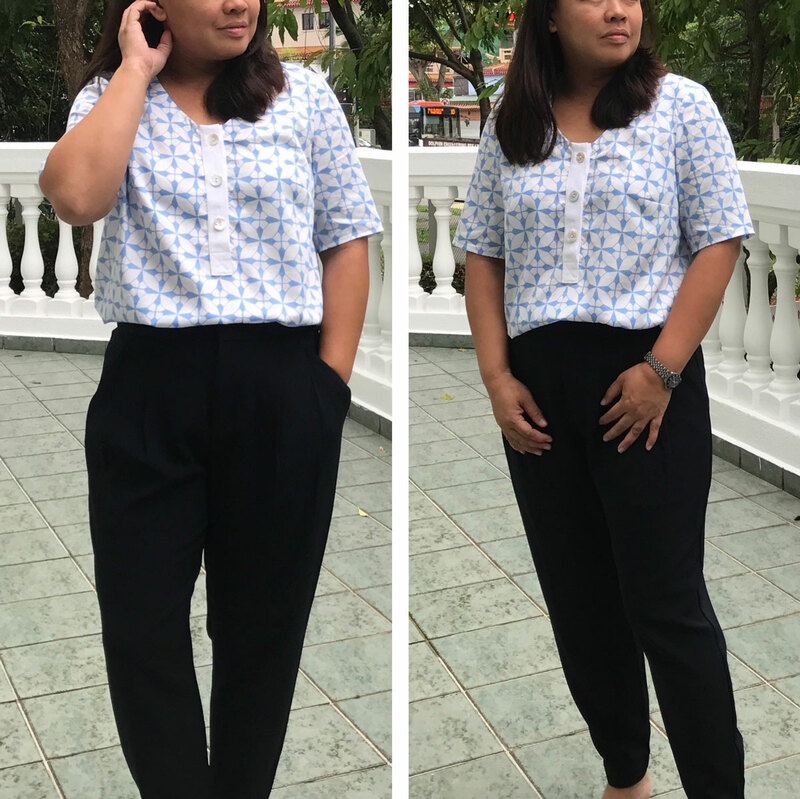 Good basic that can be done quickly when you need a sewing refresh. I’ve done 2 of version 1 and want to try a sleeveless version. I don’t care for Peter Pan collars so may try modifying that to a pointed collar. Version 3 // Blouse with peter pan collar, partial button placket and above elbow sleeves & a Version 3 dress variation! The collar and my success at putting in the placket! I’ve struggled with those before so I’m very pleased with how good it looks. 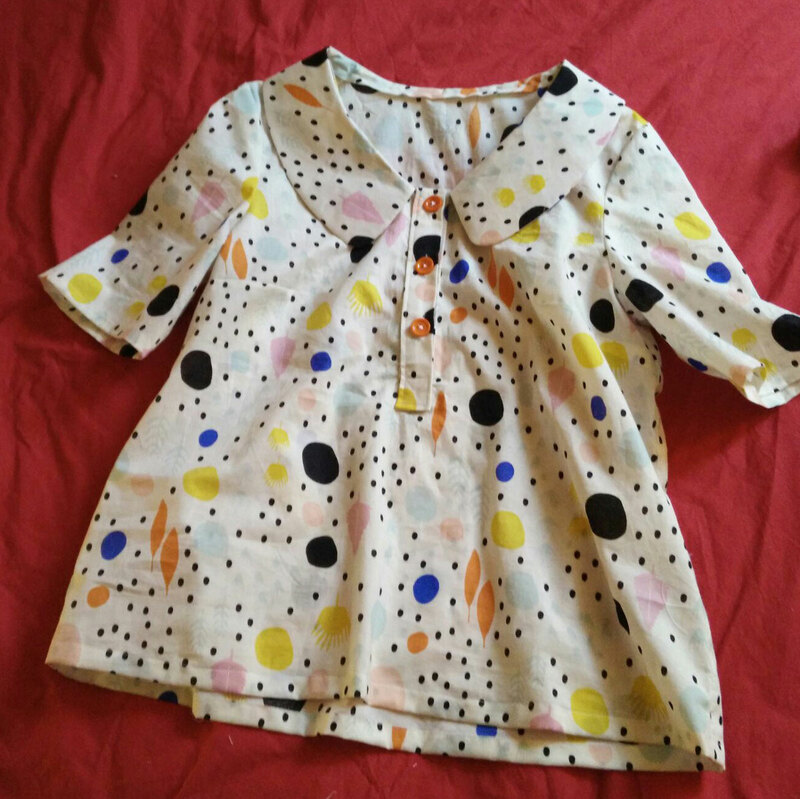 I’ve already made a dress version – I added an elastic waist – with the collar but without the buttons. I think I’ll make another dress version without elastic and with the placket but not the collar. 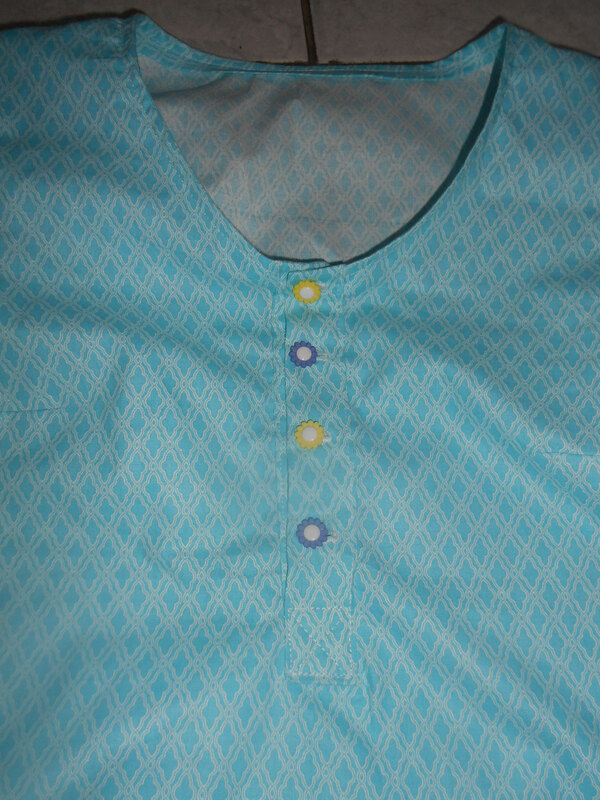 I did version 3 with a contrasting collar/placket and I would like to do a version 1. The collar is very cute! I want to make one with a spit curved hem, also thinking a longer version possibly with a hood as a beach coverup. A great casual top, a perfect addition to my mumiform wardrobe. I love floaty tops, great for the baby belly. I’m very happy with the fit across the shoulders and sleeves. I’ll definitely be making many more variations. A plain scoop version, a collared version and lengthening the pattern to make a dress. Having options to create different looks! Planning a floral viscose with placket. What about you?! We’d love to see what you’re creating from the new Banksia pattern! Don’t forget to tag your creations #MNbanksia and @megannielsenpatterns to share what you’ve been working on, and check out what everyone else is up to! Don’t have the pattern yet? Order Banksia today!